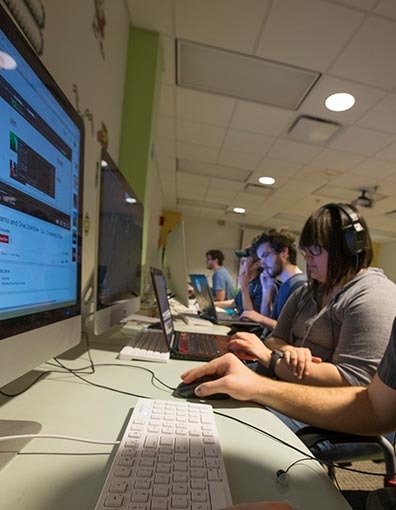 Miami University and its Armstrong Interactive Media Studies Game Center climbed nine spots in the Princeton Review’s 2018 Top Schools for Game Design list, ranking 16th overall and 3rd among all public universities. The list ranks undergraduate schools for students “to study - and launch a career in - game design.” Miami ranked 25th on the list last year and 30th in 2016. The rankings are based on the Princeton Review’s 2017 survey of 150 institutions in the U.S., Canada and abroad offering game design degree programs or courses. The survey collects information including academic offerings, lab facilities, starting salaries and career achievements. More than 40 data points in academics, faculty, technology and career were analyzed for the total scores. Students in a 3-D digital game design class. Undergraduate and graduate students enrolled in the schools on the lists also gain valuable professional experience while in school. According to its 2017 survey of administrators at the schools, 88 percent of their undergrad and/or graduate game design students who graduated in 2017 developed actionable plans to launch games while in school. Moreover, 52 percent of undergrads at these schools worked on games that were shipped before they graduated. Miami’s digital game studies minor includes courses across disciplines —from the Armstrong Institute for Interactive Media Studies (AIMS); the College of Arts and Sciences; the College of Creative Arts; the College of Education, Health, and Society; and the University Libraries. "Miami's game program builds on our core strength: a liberal arts education for the new economy," Glenn Platt, director of AIMS and professor of marketing, said. "The game program takes STEM education and wraps business, storytelling, psychology and art around it. That offering, even among the others on the list, is unique." Since 2010, the Princeton Review has reported its game design program rankings annually and partners with PC Gamer to publish the list in the May issue. The magazine has a feature on the ranking lists detailing schools’ unique programs, prominent professors and alumni. The May issue will be on newsstands Tuesday, March 27.